Our licensed technicians are factory trained and certified. They work with all the major brands such as Avantco, Bakers Pride, Blodgett, Delfield, Ice-O-Matic, McCall, Perlick, Sub-Zero, Traulsen, True, Turbo Air, Viking, Vogt, Vulcan, Wolf and much more. We have the skills and knowledge necessary to keep all of your commercial kitchen equipment in top shape. Whether you need professional installation, repair or maintenance, we can do it all. We always come ready and on time carrying most advanced equipment and tools with us. When you run a coffee shop, a bars or a restaurant your commercial kitchen equipment is essential for your business. Without it, you will not be able to serve your customers. If your equipment needs service, you will need a professional commercial kitchen repair company you can trust. We are such a company. We understand the complexity of running a commercial kitchen, and we will cater to your every need in terms of customer service. Our services are fast and accurate. We provide free over the phone estimates for most of the jobs. Same day appointments are also available. We are more than willing to work around your schedule. Also, we promise not to disturb your customers or your staff. Overall all our goal is to make this as convenient as possible for you and your team. When it comes to commercial repair, we are you go to guys. Our company Top Home Appliance Repair has more than 30 years of experience serving bakeries, bars/taverns, caterers, delis, grocery stores, convenience stores, supermarkets, hotels, restaurants, and much more. We are family owned and family operated business. Our service area includes East Bay, Marin County, Oakland, and Novato as well as surrounding areas. We promise you outstanding commercial kitchen repair service at very reasonable prices! Besides commercial appliance repair, we also do residential appliance repair. After you give us a call or fill out our short contact form, we will provide you with a free, accurate estimate. Then we will schedule an appointment at the time most convenient for you. Our commercial kitchen repair specialists will be on their way to your business in no time at all. They will carry with them all the tools necessary to diagnose and fix your equipment. We usually also, bring all the necessary parts with us. So, a second appointment is often not needed. If we do have to order something, we try to do it in very timely manner. We value your time and try to make our service fast and convenient. Our repair specialists will examine your equipment and will soon be able to figure out what the problem is. We will work quickly on repairs without disturbing your or your customers. Out technicians will run safety test after the job is finished. We want to make sure that everything is safe to use and to work. We will also clean up after ourselves clean up after ourselves. We guarantee that your equipment will work great after an appointment with us. Our company also offers monthly, annual or biannual service for your business. This way you get a total peace of mind and less hassle for you. Also, our repair experts are always happy to share tips with you how to keep your equipment well maintained. Our goal is to keep your commercial kitchen working for as long as possible without giving you any troubles. Whatever your commercial kitchen repair needs might be, we are ready and able to help you with any of them. 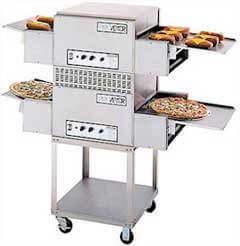 Our company specializes in all commercial appliance repairs such as refrigerator, ice machine, dishwasher, ovens, steam ovens, bbq grill, range, fryer, pizza oven, steam cooker, food warmer, etc. We have a lot of experience, and we are factory trained and certified to repair the majority of commercial brands. You will not be able to find a more dedicated and knowledgeable team. We provide outstanding customer service to all of our clients. You can be sure that our team will be courteous and respectful of you. They will be eager and ready to help you in any way they can. We guarantee that you will be totally satisfied with our work, and your appliance will be fully functional! For all your commercial kitchen repair in Oakland and commercial kitchen repair in East Bay call us at 925-265-7782. For your commercial kitchen repair in Novato and commercial kitchen repair in Marin County, please call us 628-214-0064. Or you can fill out our short contact form. We are here to answer any of your questions and make an appointment for you right away.